Developing the next generation of watershed stewards. We offer watershed education programs for all ages, which focus on connecting local communities to watersheds, nature and stewardship opportunities. Our programs are aligned to the Next Generation Science Standards and take into account current best practices in science and environmental education. We are committed to providing quality STEM experiences for all students. Our elementary programs focus on introducing students to watersheds and providing opportunities for them to explore nature in their neighborhood. We believe that spending time outside in local parks is key to establishing a lifelong connection to nature. Our Watershed Education Programs include themes around watersheds, marine debris, and nature exploration. Kids In Marshes (Grades 2-4): Students learn about the plants and animals that live in the salt marsh through interactive games and building a model salt marsh. They visit a local salt marsh and have the opportunity to observe birds, go on plant scavenger hunts and use nature journals. Kids in Creeks (Grades 2-4): Students learn about riparian habitats and how animals, plants and humans all need creeks. They visit a local creek and engage in study of macroinvertebrates, water quality testing and wildlife observation. 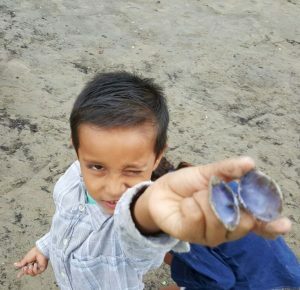 From Me to the Sea (Grades K-5): Students make connections between their schools, watersheds and marine debris through hands-on activities, shoreline exploration and action projects. Explore Your Watershed (Grades 4-5): This is an exciting year-long watershed exploration program. Students explore ecosystem connections, water quality, and species diversity through nature hikes, science journaling, games, and macroinvertebrate study. 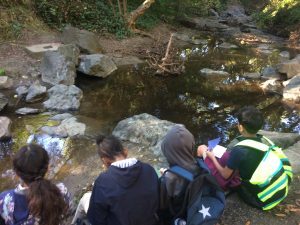 Riparian Lab is a multi-week (8-12 weeks, depending on the venue) creek-based environmental education program that serves children age 6-13 in Richmond or San Pablo. In this after school or summer program, participants explore a creek habitat through a series of hands-on activities. Our middle school and high school programs focus on introducing older students to watersheds through data collection, service learning, design challenge and discussion. Through actual hands-on engagement in local parks and on-going projects, we believe that middle and high school students can be inspired to become leaders in watershed stewardship. Wild Oysters (Grades 9-12): Wild Oysters is a high school program that uses native Olympia oysters as a teaching tool. Students get the chance to experience a day in the life of a marine biologist as they put on rubber boots and collect data on an oyster reef in the San Francisco Bay. They have the opportunity to taste oysters in Tomales Bay as they learn about aquaculture. We offer optional additional teacher-led lessons and teacher training as well as a modified short program to select participating classes. Learn more here. 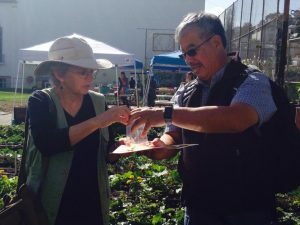 Rains to Roots (Grades 9-12): In this program, students explore the complicated question: How can you restore natural function to urban watersheds? 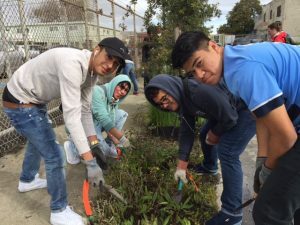 Students investigate the issues that affect their communities from urban runoff and stormwater and learn about how these issues can be mitigated through green infrastructure. From Me to the Sea (Grades 6-12): In our From Me to the Sea middle school and high school program, students engage in citizen science data collection and analysis around marine debris to experience firsthand the scope of the problem, but also the efforts underway to solve it. 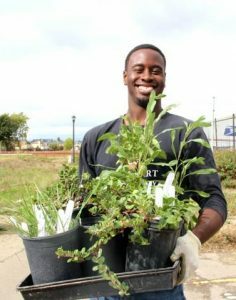 Our Greening Urban Watersheds Service Learning Programs include service trips to various restoration sites, including tree planting opportunities. We seek to encourage the next generation to discover their passion for environmental work. Green Collar Corps is a job training program for youth from Contra Costa County. It focuses on leadership and job skills training, as well as specific instruction in conservation and restoration work. Our interns contribute directly to meaningful and exciting projects, learn new skills, and gain valuable experience, all while working for vital environmental change. Please visit our Green Careers page for more information about our current offerings. It is only with the help of teachers that we can aspire to developing environmental stewards. We partner with teachers to implement our programs and we offer professional learning opportunities on how to teach about watersheds and engage students in hands-on science. We have a long history of high quality curriculum offerings and continue to develop and revise curriculum on a variety of environmental topics. The following lessons provide opportunities for investigating and learning about local watersheds. Check back often as more activities will be added soon! 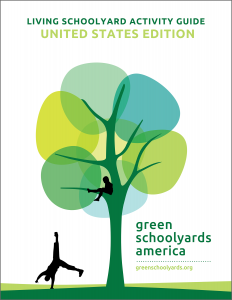 We are excited to announce our participation in Green Schoolyards America’s 2018 Living Schoolyard Activity Guide. You can find our contribution, Observing a Creek, on page 161. It is for ages 8-18 and is designed as an easy creek observation activity for schools with creeks on or near their school campus. Looking for a fun activity to do outside with your family? Explore the activities we’ve put together below! 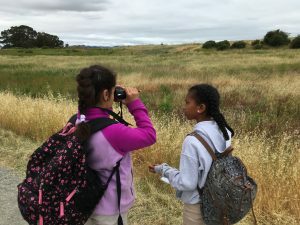 If you’re interested in exploring your watershed or new parts of the Bay Area, check out some of the parks and locations we recommended through our Summer Photo Contest from August 2017! 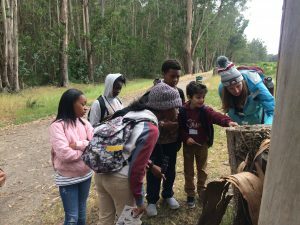 We invite schools in Contra Costa and Alameda counties, especially in Richmond, to apply for our watershed education programs. Title 1 schools are eligible for our programs at no cost, and we offer sliding scale fee-for-service programs to other schools starting at $125. Please fill out the interest form below to find out more, and allow for 1-2 weeks for a response from one of our Education Team staff to get back to you. Please note that filling out this form does not guarantee you a program. Based on our availability and funding, we will reach out to you to schedule a program.